Running Christmas Crafts Fair on Kaua’i. Disney’s “Newsies!” — Tony-winning Broadway Musical Hit inspires everyone to fight for what’s right and seize the day. Wendy Hollender, botanical artist, instructor & author, will lead intensive botanical illustration workshops along with fellow instructors Veronica Fannin and John Patoriza Pinol. All three of our ensembles will join forces to perform selections from our Winter Concerts that will be held at the Kauai Community College Performing Arts Center on the 9th and 14th of December. Sponsored by the County of Kauai, the Hawaii Tourism Authority; HouseMart Ace and Crafts; KQNG; Friends of the Festival of Lights. 9:00 am – sale starts for Friend of the NSL members. Join at the sale. Calling all Schools and non-profit facilities – Books Available FREE! Right after each quarterly sale, we remove over a thousand books, DVDs and CDs from our shelves to make room for new arrivals. These items are available free to Kauai’s public and public charter schools (or school volunteers), public libraries and non-profit organizations such as care facilities, thrift stores, correctional facilities, food banks, etc. Kauai Island Singers Showcase (KISS) presents A Christmas Concert. Celebrate the season at our acoustic concert in the church sanctuary. Featuring many beloved holiday songs sung by eight talented vocalists — Barbara Pendragon, Lee Miller, Melissa Mojo, Siri Shabad, Melanie Turner, Alison Miller, Steve Backinoff and Trishana Star. Our talented musicians include: Hank Curtis on piano, Nick Lasky on upright bass and Kiah Abendroth on trumpet. Come sing your favorite Christmas carols accompanied by two amazing harpists: Sylvia Woods and Madeleine Brandli. Sylvia Woods is a world-renowned Celtic harpist who lives in Princeville. ?Madeleine Brandli plays the large concert pedal harp and lives part-time in Honolulu. 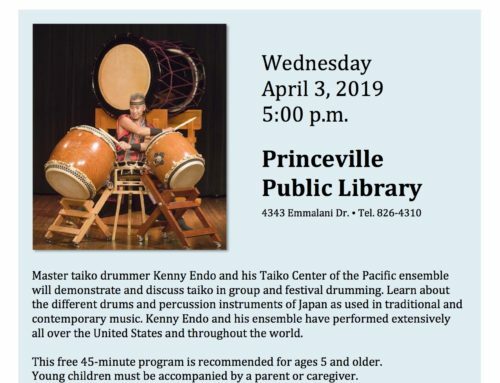 ?The singing will be led by Princeville musician Bob Smith. In addition to caroling, these festive concerts will also feature Christmas harp solos and fun surprises! This year’s 4th annual concerts will feature carols about animals. ?Join us for our fun and joyful concerts of Advent carols and Christmas music. Come sing along with harps! Featuring music by Tchaikovsky, Beethoven, Grundman, Hylkil, and Cacavas. This concert includes classical music, folk songs, and holiday music. There will be music for all tastes! Featuring 120+ Beginning Band students in their first concert. Featuring everything from Jazz to Classical music! Highlights from the program include music from every “Harry Potter” Movie, jazz standards, and holiday music. performing live from the Nahoku Hano Hano Best Instrumental Album of the Year and Best Instrumental Song of the Year, 2015. Featuring students for the 2nd and 3rd Year Bands and the CKMS Jazz Band. Come and join us for a night of great music! Participants will learn how to use drama strategies to enhance their storytelling in the classroom and how to use creative dance to engage students in comprehending text, identifying key ideas and details, and retelling stories. The literature for the course will be place based, featuring stories of Kaua’i and other islands in Hawai’i. The interactive, place-based, storytelling process is learned one aspect at a time providing opportunity for implementation between sessions. Teachers will acquire a deeper understanding and comfort level with drama and dance strategies to enrich their language arts program and to impact student literacy goals. The 4th Annual Kaua’i Steel Guitar Festival will be held on Friday and Saturday, March 1-2, 2019, at the Courtyard Kaua’i at Coconut Beach. 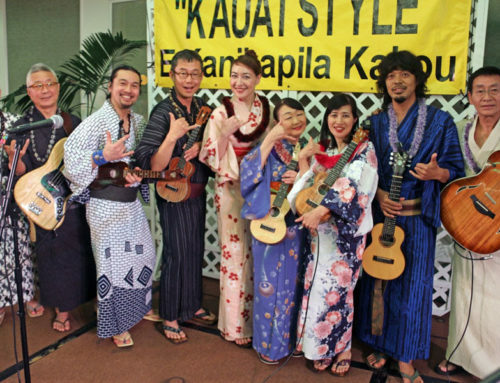 This festival will be presented in the days preceding the annual Aloha Music Camp as an extension of the Hawaiian Steel Guitar experience that is offered at the camp. In addition to steel guitar performances by Hawaii steel guitar masters, the festival includes workshops, jam sessions where festival guests play along with the steel guitar masters, and Open Stage sessions where amateur and professional Hawaiian Steel Guitarists will present their own programs to festival guests. Educational presentations will be made to local area schools on Thursday and Friday mornings. 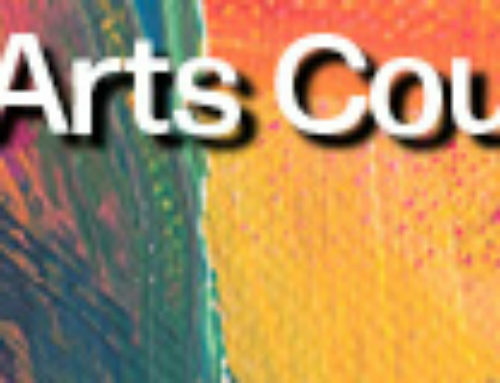 Open stage sessions will be held on Friday beginning at noon, steel guitar workshops will be held Friday evening, and Saturday’s Ho’olaule’a will be held from noon to 6 P.M. Saturday’s program will also include a vintage steel guitar exhibit, and steel guitar hands-on opportunities will be offered to festival guests. A pre-festival KIKA PILA jam session will be held at Keoki’s Paradise in Poipu Beach Thursday evening between 6PM and 9PM. 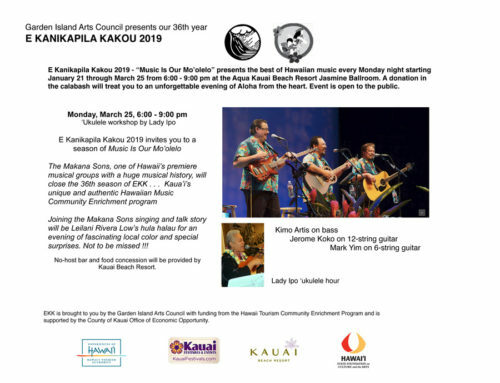 Festival featured musicians and Next Generation steel guitarists and members of the Ke Kula Mele ensemble will be joined by guest performers for a fun evening. Click here for an area map. 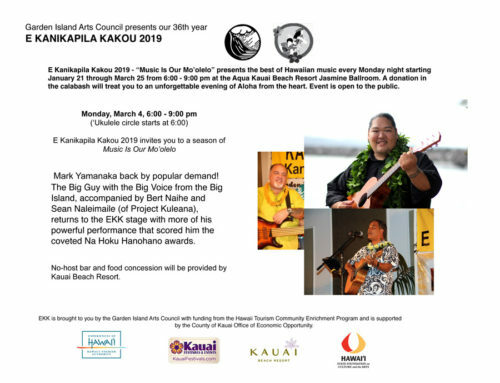 Unplugged public kanikapila jam sessions will be held in the hotel’s Makai Lounge beginning at 8:30 P.M. Friday and Saturday where festival guests can join the festival’s steel guitar masters and possible guest artists playing and singing Hawaiian favorites. The festival is presented free to the public by Hawaii Institute for Music Enrichment and Learning Experiences (HIMELE) in association with the Ke Kula Mele Hawai’i School of Hawaiian Music, with grants and support from the Hawaii Tourism Authority’s Community Enrichment Program (CEP) and from the State Foundation on Culture and the Arts through appropriations from the Legislature of the State of Hawaii and by the National Endowment for the Arts. Please note that the festival website should be checked for updated festival information. Accredited teacher graduate of the Royal Ballet School London, England. Diploma Royal Academy of Dancing. Home Studio located at Eyes Wide Open Productions Nawiliwili/Lihue as well as a satellite studio on the North Shore, Princeville community center.